A 2,200-year-old clay jar found near Baghdad, Iraq, has been described as the oldest known electric battery in existence. The clay jar and others like it are part of the holdings of the National Museum of Iraq and have been attributed to the Parthian Empire — an ancient Asian culture that ruled most of the Middle East from 247 B.C. to A.D. 228. The jar itself has been dated to sometime around 200 B.C. It was first described in 1938 by German archaeologist Wilhelm Konig, and to this day, it is uncertain whether Konig dug it up himself or found it archived in the museum. So how is it that a 2,200-year-old clay jar can be called a battery? Those who’ve examined it closely say that there’s little else that it can be. The nondescript earthen jar is only 5½ inches high by 3 inches across. The opening was sealed with an asphalt plug, which held in place a copper sheet, rolled into a tube.This tube was capped at the bottom with a copper disc held in place by more asphalt. A narrow iron rod was stuck through the upper asphalt plug and hung down into the center of the copper tube — not touching any part of it. Fill the jar with an acidic liquid, such as vinegar or fermented grape juice, and you have yourself a battery capable of generating a small current. 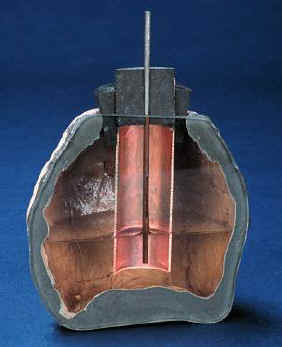 The acidic liquid permits a flow of electrons from the copper tube to the iron rod when the two metal terminals are connected. This is basically the same principle that was discovered by Galvani 2,000 years later and that Volta successfully harnessed into the first modern battery a few years later. Perhaps the battery was used as a ready source of less slimy analgesic electricity. Other theories hold that several batteries could have been linked together to generate a higher voltage for the use in electroplating gold to a silver surface. More experiments with several Baghdad-type batteries have shown this to be possible.